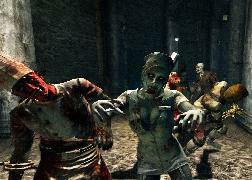 A lame zombie brawler is rendered unplayable by its motion control scheme. 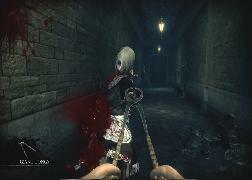 Rise of Nightmares is a first-person horror beat-em-up that relies on the Kinect sensor for controls. 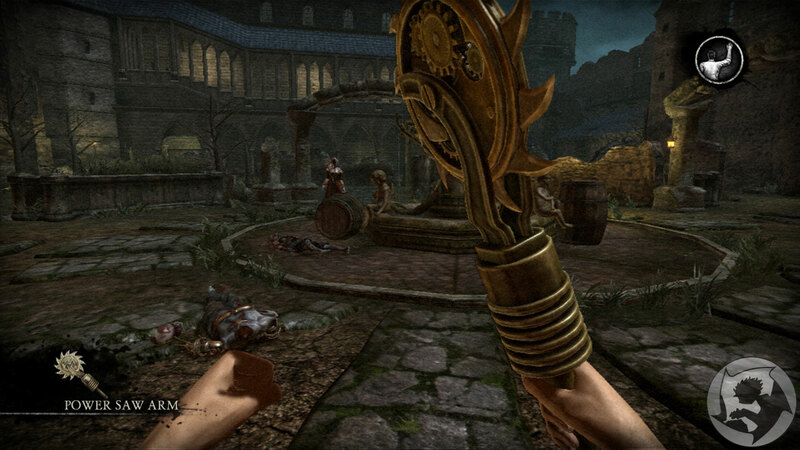 You pivot your shoulders left and right to turn, put your foot forward to walk, and punch or slash with your fists to attack enemies in first person. At least, that’s what the game tells you to do. The controls do not work. They are an abject failure. This might not be the developer’s fault. My limited experience with several Kinect games so far has been generally frustrating. But Rise of Nightmare is by far one of the most broken games I’ve played, and it’s all thanks to the body motion controls. The Kinect requires about 6 feet of clearance between itself and you, with nothing in between. I’ve lived in a lot of different places–we moved nine times in the last decade–and of all the places I’ve lived in, my current house has the largest living room. Even if I push my coffee table all the way back against the couch, which is itself touching a wall, I can barely create six feet of space. Rise of Nightmares tells me that I’m in the “optimal play position” at this location but then warns me that I am too close constantly. OK, so I flip my coffee table on its end, move the (vastly superior) Wii Balance Board that I hide under it elsewhere, and that buys me another two feet of space. Now I really am in the optimal range for the Kinect, but the game is still awful. For instance, early in the game the tutorial teaches you how to move. Put your foot forward to walk, further forward to run. About ten minutes later you must run across a sinking train car. OK, put your foot forward. Wrong, you die. I died 26 times in this location. What they actually want you to do is run in place, an action you have never performed, nor will ever perform again in this game. Only, the detection is poor, so even if you try running in place a few times, it might not work and you might feel like an idiot for dying 26 times in the first ten minutes of the game. This was the absolute worst example for me, but there are problems like this all over Rise of Nightmares. Simple actions, such as opening doors and punching with your fists, are routinely misread. 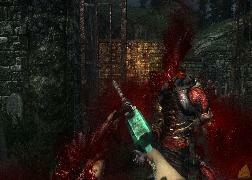 And some genius at Sega decided to add a bunch of one-hit-kill sequences in which you must step back to avoid spikes. I obviously can’t step back because I’ve already got my back up against a wall just to be detected by the stupid Kinect in the first place. Even when the controls are detected correctly it feels like you are playing underwater. Everything is so imprecise and slow–there’s a huge amount of lag between your action and your avatar’s version of that action on the screen. If you could see your avatar walking around it would look like a drunk person–it’s impossible to go straight and equally hard to turn to a desired angle reliably. I will admit that combat is occasionally fun, mostly because there are some fun weapons to wield, but it’s always a battle against the controls and not the monsters. Walking around is so difficult that the developers actually included a “walk to the next location for me” button. The problem with this kind of game is that the controls are broken because of the novelty of the technology, not because the game design is afforded by that technology. Rise of Nightmares played with a controller would be a better game. The game is in service to the novelty rather than the technology being in service to the game design. It’s a gimmick. OK, I’m done talking about controls. They are terrible and utterly ruin the game. I woke up with horrible back pain. Let’s move on. Rise of Nightmares is, when you take the controls out of the equation, basically a House of the Dead-style light gun game with (somewhat) free movement and melee attacks instead of a light gun. The free movement thing is sort of a false feature, though, because while you can move freely within your environment (must resist urge to make a quip about movement controls here), the path through the game is almost entirely linear. There are minor reasons to explore (mostly to find weapons and collectables) but they are all ancillary to the main path and add little to the game. Free movement isn’t an obvious benefit to this kind of game–it’s a solution without a problem. Given that Rise of Nightmares is best thought of as a light gun game without the light gun, there’s not a whole lot left to its design to explore. 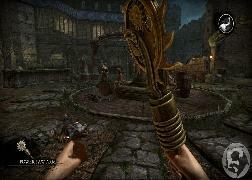 The levels are linear, the combat is simple and routine (collect weapons, attack and guard), and there aren’t a whole lot of other mechanics to dissect. The weapons are varied and fun, but they all basically do the same thing, which is hack limbs off the zombie things that approach you slowly one at a time. There are a few puzzles in the game but most of them are short and trivial; mostly flipping switches or finding items to unlock doors, things like that. There is one mechanic that I liked and felt was underused. The Pyramid Head of this game (seems like every game has one lately) is a big dude in a trench coat with a metal plate over his face named Ernst. Thought he can open the plate, Ernst apparently prefers to walk around in circles blind. Occasionally you will run into Ernst while roaming the halls of some unlikely mansion, and in these sections you must stop moving so that he doesn’t hear you. It’s unclear which kinds of movements will make sound, so when the game warns you to stop and be quiet your best bet is to just freeze. Unless he runs into you, Ernst won’t notice that you are there as long as you remain quiet. 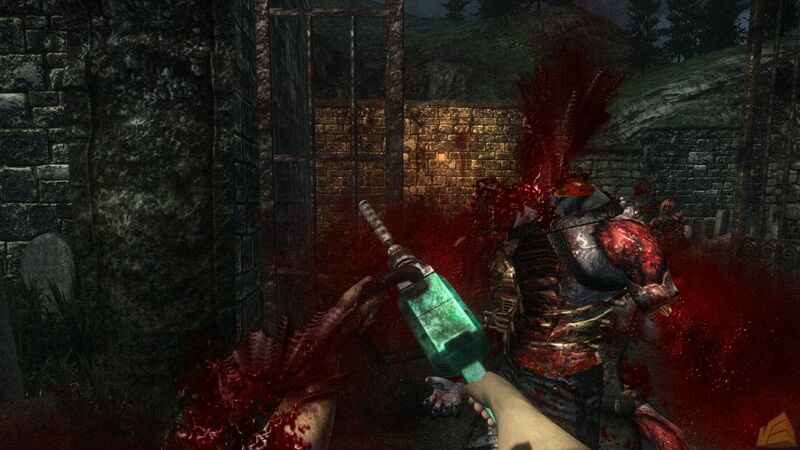 Similar systems exist in other horror games (notably Amnesia: The Dark Descent), and generally those other games do it better. But as a Kinect game, this mechanic is the only time during play when the game context and controls align: ceasing all movement is actually hard to do, and though the game isn’t the least bit scary, I caught myself holding my breath once or twice as Ernst waltzed by. The one thing about Rise of Nightmares that has me scratching my head is the story. Not the content of the story itself–that’s fairly nonsensical and not very mysterious. Rather, the very existence of the story is interesting. Remember, this is basically a light gun shooter like House of the Dead. It doesn’t really need any story to operate: either you like punching the air to kill monsters or you don’t. 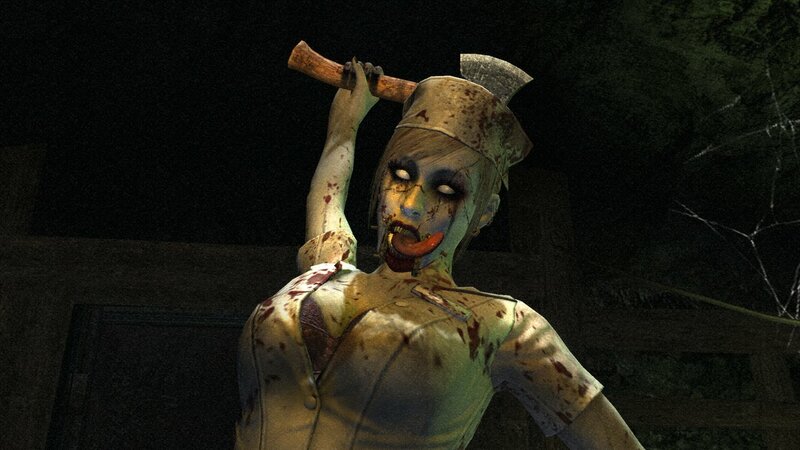 House of the Dead’s thin excuses for story have always been more than enough to carry those games because you either like shooting zombies or you don’t. Unlike other types of horror games, the mechanics are really the whole show. That’s why I found it surprising that Rise of Nightmares spends quite a bit of time on story exposition. There are cut scenes and lots of characters, but above and beyond that the last fourth of the game is designed to communicate the story through play. That’s not to say that the story is actually good or anything–it’s terrible. But occasionally it contains (very brief) flashes of brilliance, and there sure is a lot of effort put into relaying it to the player. The effort is mostly wasted, as the story isn’t worth it and the control problems overshadow everything else, but it makes me wonder if Rise of Nightmares was originally planned as a traditional game. Perhaps it feels so broken because it was converted to a Kinect title mid-way through development? I don’t know, but I am surprised to see so much developer effort go into story in a game which has almost no use for it. 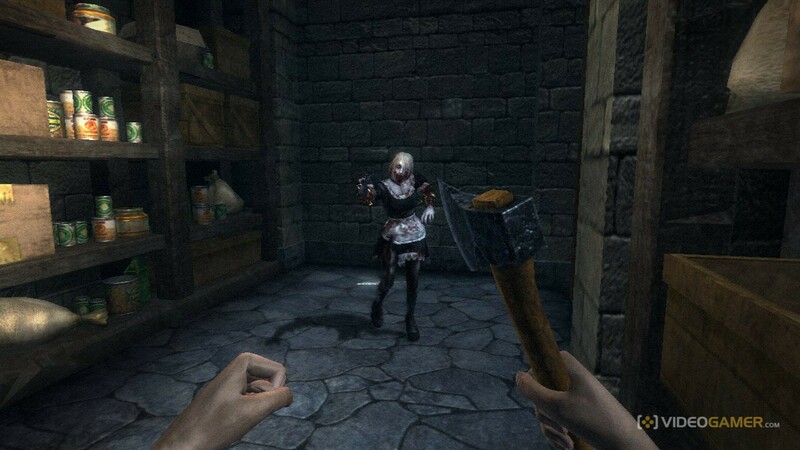 Though I complained quite a bit about the simplicity of Night of Sacrifice, the first-person Wii Balance Board horror game, Rise of Nightmares makes it look like an understated art piece, something designed to be simple rather than as a result of incompetence. Rise of Nightmares, on the other hand, is a more complex but much, much worse game.